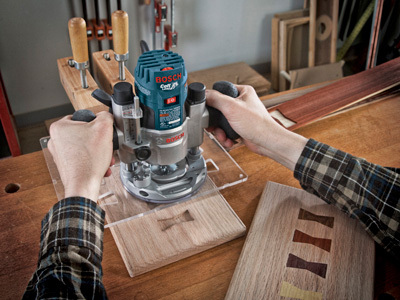 The Bosch PR20EVS Colt™ variable-speed palm-grip router puts routing power and precision in the palm of your hand. 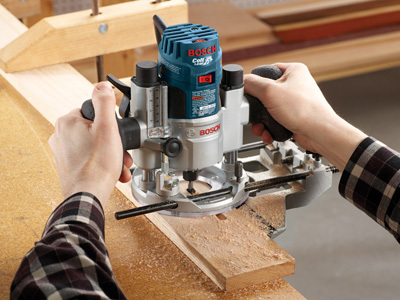 The PR20EVS has an ergonomic palm-grip design with softgrip to make it very comfortable to hold, yet it also has ample power, making it typically easier to use than larger routers. 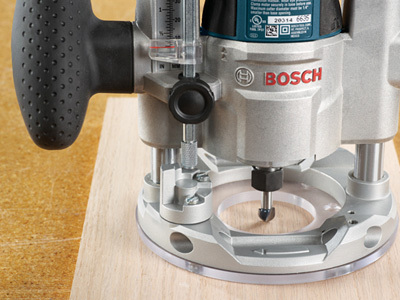 It's more than a just a laminate trimmer, as it is the ideal tool for putting roundovers on deck railings, mortising for hinges, slot cutting, and much more. The motor features soft-start, a variable-speed control, and Constant Response™ circuitry to maintain speed under load. 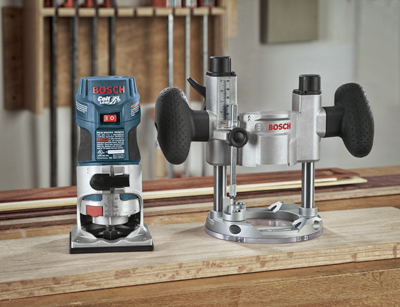 The PR001 fixed base features macro- and micro-fine depth adjustment. 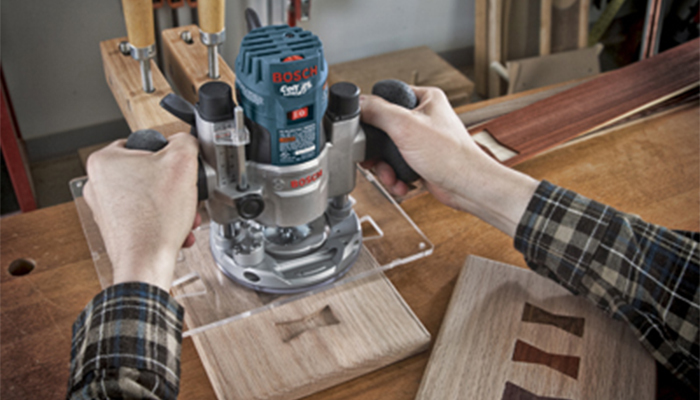 The PR20EVSPK also includes the PR011 plunge base, which greatly expands the router's versatility. 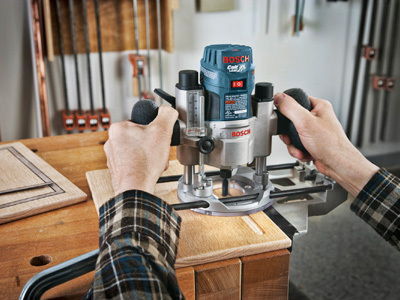 It features a smooth plunge action and spring-lock plunge control lever. 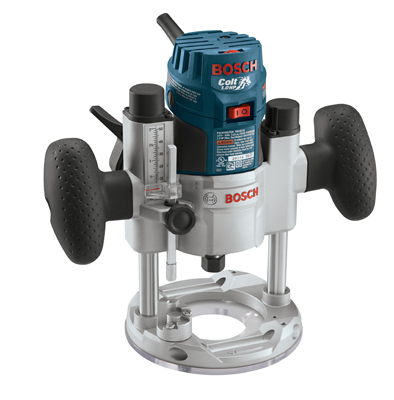 It's depth adjustment system includes a seven-step adjustable depth stop turret plus a micro-fine adjustment on the depth rod for fast, accurate bit depth setting. 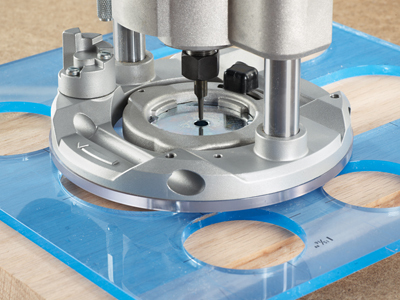 The Precision Centering Design on the plunge base allows the subbase to be centered around the bit, which makes it easy to keep the bit on intended cutline when using jigs, templets, dovetail fixtures and similar guidance devices. 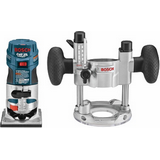 The PR011 plunge accepts several different Bosch routing attachments, including the RA1126 Tool-free Templet Guide Adapter, RA1054 Deluxe Router Guide, and PR012 Dust Hood. Finally, the PR20EVSPK also includes a self-releasing 1/4 In. collet chuck, comfortable forged bit-changing wrenches, edge guide for use with the fixed base and a case.